I think I’ve blogged about my tendency towards indecision when choosing places to eat on the spot. It’s very rare that I’ll have specific cravings, so when I meet up with someone for dinner and we don’t have a destination in mind, I tend to be more useful as a reference guide than an executive decision maker. I understand that this can be frustrating, and sometimes frustration leads to rash decisions. 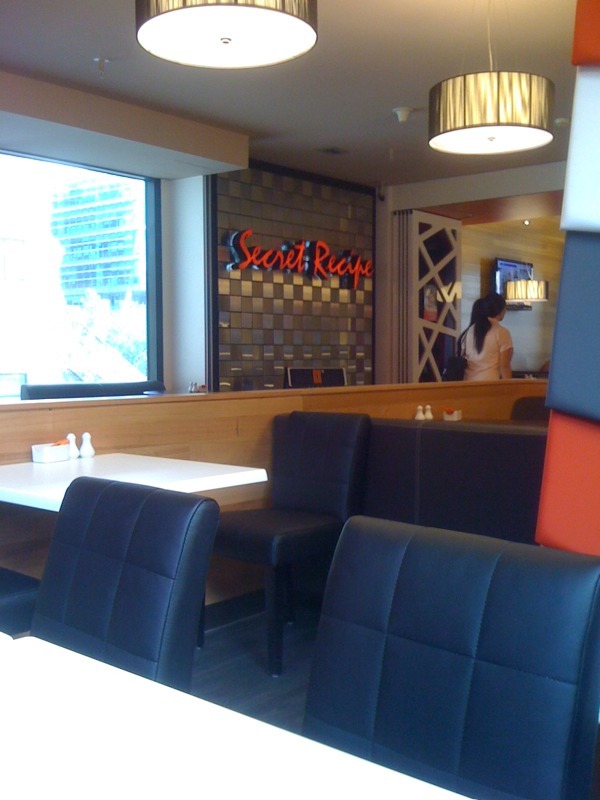 That’s how Mr R and I ended up eating at Secret Recipe, in Melbourne Central. I wasn’t aware at the time – though I had my suspicions – that Secret Recipe is a franchise operation. It’s a chain of ‘fusion’ cafes which originated in Malaysia. 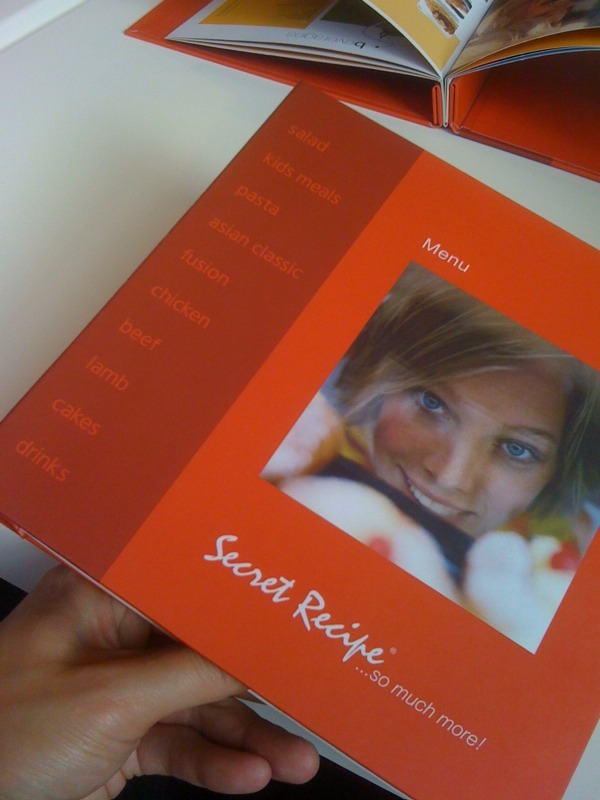 The rather mass-produced looking menus, replete with stock photography blandly inoffensive fonts kind of gave it away. Alarm bells? Perhaps. 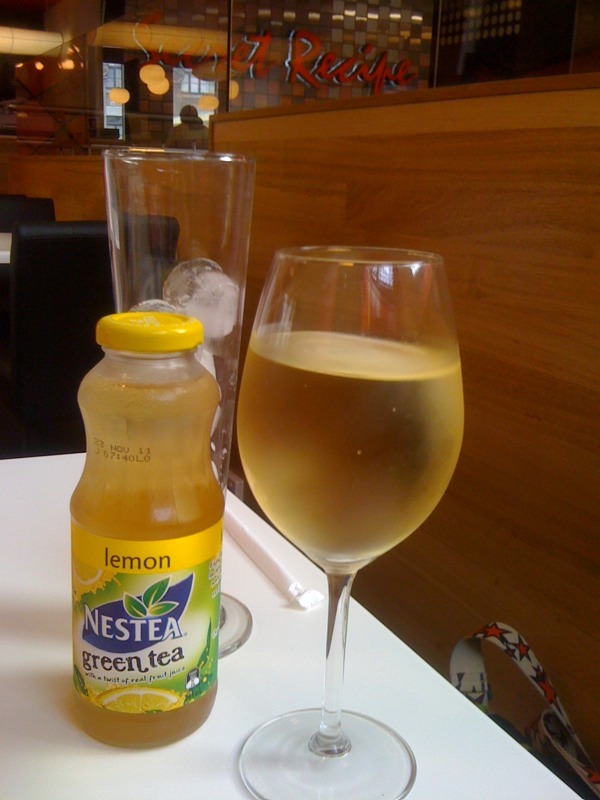 One thing the place has going for it was there’s a rather long pour on the wine. … before my char kway teow arrived. I know, I know, CKT with chips? Weird. I take back not craving specific things. I clearly crave FAT. The char kway teow wasn’t offensive, but it was pretty timid, even with the optional sambal served on the side. There was a lack of the smoky wok hei which typifies a good CKT, but that wasn’t really too much of a surprise given the modern, sterile feel of the Secret Recipe operation. Though I would have thought that a Malaysian franchise would get CKT right. Mr R went the pasta option. 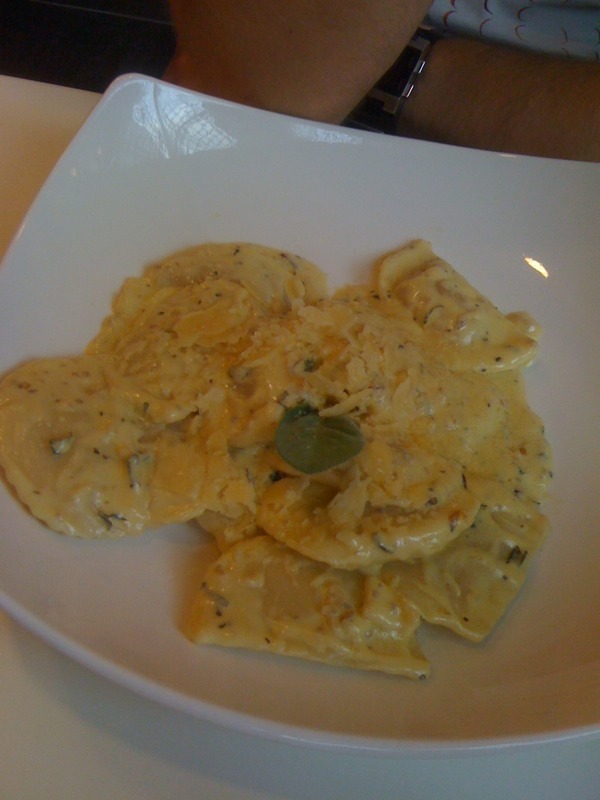 Some sort of agnolotti (pumpkin?) with a cream sauce. One of us was clearly going to fare better than the other; it’s rare to find a restaurant which can do both pasta and Malaysian food well. He seemed to really enjoy it, so perhaps despite its Malaysian roots, the Secret Recipe of the place is in its mastery of Western food. Which wouldn’t be surprising, given that would be its selling point back in Malaysia. If there are any secret recipes to this place, beyond taking common Malaysian and Western dishes, putting them on a menu together, adding some comfortable seating and executing food at a passable but mediocre standard, I certainly didn’t catch on.